For all the talk about how Eli Manning and company currently resemble the 2007 Giants — or is it the 2010 Packers?— it's worth remembering the obvious: Both of those teams not only reached the Super Bowl, but won it. And this year's Giants haven't done that, at least not yet. They've won two playoff games, and it's been a lot of fun. But to really earn those comparisons, they must keep winning. And while the Giants have already beaten the team with the best record in the league, the 49ers are a tough matchup: Manning was able to exploit Green Bay's dreadful passing defense on Sunday, but San Francisco's secondary should make things more difficult this week. (That said, San Francisco is even better defending the run. To remind you of some numbers from last weekend: Drew Brees threw for 462 yards on 40-for-62 passing; the Saints, meanwhile, gained just 37 yards on the ground.) 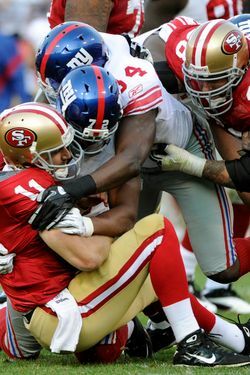 And while the Giants do a good job pressuring opposing quarterbacks, so do the 49ers: San Francisco finished the regular season with 42 sacks (which tied them for seventh), compared with the Giants' 48 (which tied them for third). A Times preview of this game reminds us that for all the attention paid to these two quarterbacks (both of whom are former top picks), "pro football remains an 11-on-11 sport, no matter how often we mistake it for quarterback-on-quarterback finger wrestling." Which is too bad, because with all due respect to Alex Smith (who was impressive last weekend), the Giants have the better quarterback. Still, while that might not be the only positional matchup worth looking at, it's a nice one to have an advantage in. Throughout this Giants playoff run so far, and particularly since they beat Green Bay last week, we've tried to take in how much things have changed over the past two months or so. Things were bleak before the Giants finished the season with three wins in the last four games, and now we're having discussions about whether Tom Coughlin has a shot at getting into the Hall of Fame. After the Jets-Giants game on Christmas Eve, we wrote that it would take more than a win in that game for either team to truly seize the city's attention. To quote ourselves: "As a coach who's reached the AFC title game two years in a row, [Rex] Ryan knows as well as anyone that getting into the playoffs and going on a run is the best way to dominate the city's back pages, particularly if the other team is at home watching." Anyway, that's exactly what's happening here: The Giants have everyone so psyched right now, we're getting articles about what kind of Hall of Fame consideration Tom Coughlin would get if they win another Super Bowl. Talk like that might be premature (and might make superstitious Giants fan cringe), but such is the kind of excitement that accompanies a football team on a playoff run. The Giants are hot right now, but don't forget, so are the 49ers: They won their final three regular-season games, then beat a really good Saints team last weekend. (The last team to beat them, by the way? The Cardinals, led by Official Sports Section Favorite Athlete John Skelton.) The Giants are in a familiar position here: facing a strong team that beat them in a close game during the regular season. And so, once again, they seek revenge, only this time, with a trip to the Super Bowl on the line, the stakes are even higher.